This rustic farmhouse in Bigfork, Montana has undergone an impressive transformation since its new owners, Felesha and Jeremiah McAfee, took possession in 2013. The home's interior had received a complete renovation in the 1970's and still displayed the wallpaper and material choices of that decade. Needless to say, a thorough overhaul was necessary to achieve the rustic aesthetic that the homeowner's envisioned for this tucked-away home. The home was completely gutted, and everything brought up to code to ensure that the farmhouse would be beautiful and safe. Rustic wood beams and white shiplapped walls are featured in many of the rooms and create the ideal foundation for the furniture and accessories within. A few walls remain unpainted to allow the natural patina of the wood to shine through. As a vacation home and sometimes rental this Montana farmhouse is immediately welcoming with its natural materials and subdued color palette. The minimalistic decor allows one to relax and reflect without being bombarded by busy decor and vibrant color schemes. This rustic gem is sure to have guests coming back year after year. A large picture window in the living room fills the space with plenty of natural light. The open staircase, with its striped burlap runner acts as a unique architectural feature in this unadorned space. The laundry room, located beside the staircase, provides the homeowners and guests with a clean and bright place to wash their clothes. The upstairs master suite takes on a certain Scandinavian flair with loads of white surfaces and rustic wood. A wood and wicker bedframe acts the focal point for this cozy, second-floor master. The bathroom vanity is constructed with pieces of textural wood to add to the home's rustic appeal. Back downstairs the updated kitchen features a combination of open and closed storage. A wall of open shelving allows dishware and decorative items to add interest to the space. The guest bedroom downstairs continues the pared-down feel of the home with a antique brass bed and wood details. 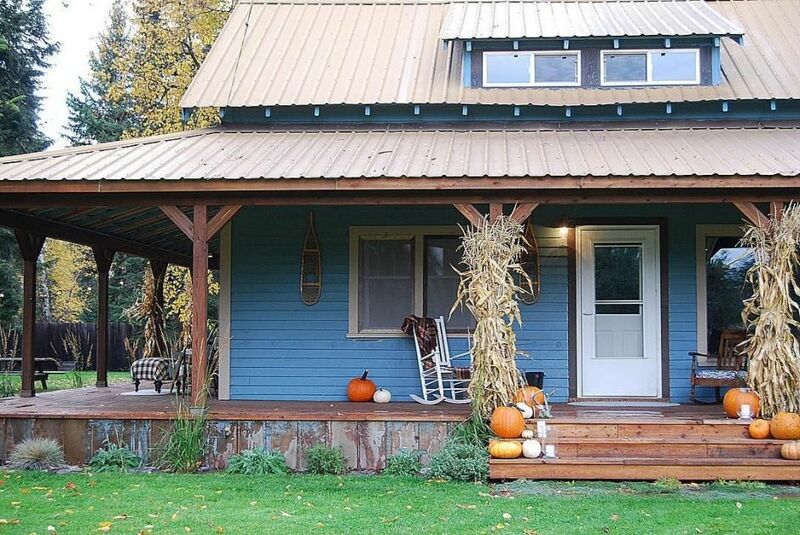 Share the beauty of this hidden Montana farmhouse with your friends on Facebook.